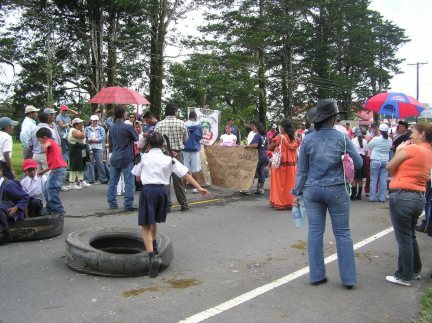 I have seen anti-government protests in Panama, but a week or so ago I was pleasantly surprised at one, I saw in the mountain town of Volcan. 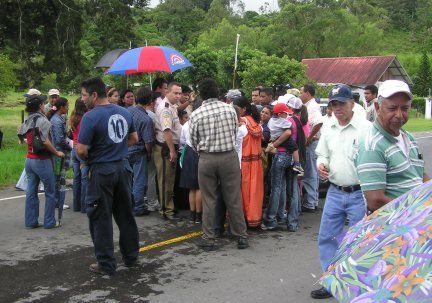 Teachers from the local primary school of Nueva California organized the protest. 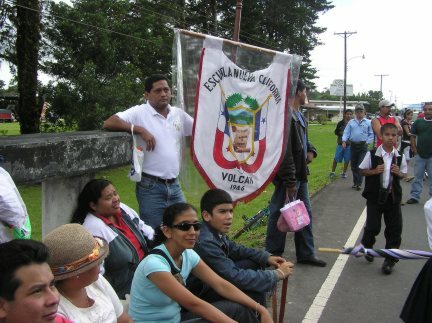 I first saw the procession at 9:30 in the morning as they headed south on Volcan's main road. At first I thought it was a funeral procession, as they were headed in the same direction as the cemetery, but then I noticed the school banners and the somewhat festive atmosphere of the participants – the majority of whom were young schoolchildren. I didn't give it much thought until about half and hour later when I noticed that traffic outside my home had come to a standstill. I thought this must be an accident as nothing was moving in either direction. After an hour of this standstill I thought I should investigate and camera in hand I walked about three hundred yards down the road heading into town. At the first small bridge I saw the same small school group blocking the main road. They had tires and part of a rear axle assembly as their means of impeding traffic. These were more symbolic than physical as I am sure any truck could have easily rolled over them. The local police was their trying to persuade the teachers and students to lift the barrier, but the teachers were adamant that they were not going to move until the administration conceded to their demands. I talked to teacher Eric Mendoza and asked what they were protesting about. He explained that the Nueva California school was built with grants from the Kennedy government back in the 60”s. The wooden structure was now crumbling, and they feared that another earthquake could cause the entire building to collapse on the students. He said that they had been petitioning the authority for ten years and all they received was a succession of broken promises. The protest seemed to set for the day, so I returned home for dinner, I did however keep watching through the window the ever growing line of non-moving traffic. After four hours, at 1:25, the traffic did start moving and Volcan's peaceful protest. was over. 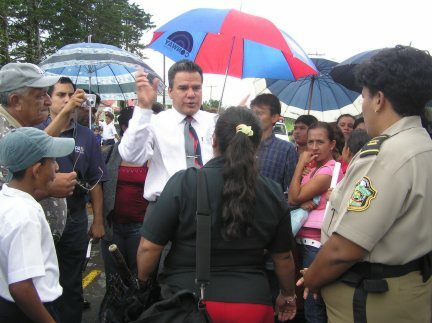 Representatives from the government had given the protesters an agreement – in writing - that the school would be fixed. A few days later I traveled to see the structure for myself, and was invited for a tour by the school sub-director, Elizabeth Quintero. The evidence was clear of major structural decay, several support beams were rotted through and the rain was able to blow through large gaps in the wall. As we entered each classroom the students immediately stood up in respect. Wow, I thought to myself, this is something we do not have back home. I am a firm believer that respect and discipline in school, will eventually reflect those same qualities in society. Panama may be a third world country, but in certain aspects it has qualities that we in the “progressive” first world have lamentably lost. Elizabeth then gave me a real shocker as she took me into a recently, well-constructed computer room. Lining the walls of this air conditioned facility were twenty five modern computers - all with, state of the art, flat screen displays. This she explained was a donation from the Japanese government. Computers are proving to be a major asset for both teachers and students at this school. Most students, I am told have two aims: first they want access to the Internet and second, they want to learn English. The greatest lesson that was learned from the school road blockade was that occasionally, quiet and peaceful protests can have loud and positive results.